Update 12/14/09: I've moved the code for this program to GitHub. I bought one of these at Micro Center a couple of weeks ago (I just now got around to posting the code -- I've been busy with a few other things) because I wanted to flex my reverse engineering muscles, and work with libhid. I knew there was no way in hell it would come with software for Linux, and at only $14.99 it was quite affordable. Therefore, I went about writing some software to do the job. USB Vendor ID: 0x04d9 Holtek Semiconductor, Inc.
You can download the source here. The program is written in C, and licensed under the GNU GPLv3. Instructions for how to compile the program are included in the README. You'll find the original documentation (converted to PDF) in the doc directory. 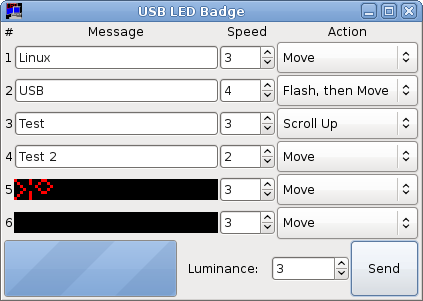 Please make sure the badge is connected before running the program. pkg-config, GLib/GDK/GTK+ headers, libusb headers, libhid headers, etc. By clicking in the grid, you can set or unset the pixels that comprise the image displayed. If you right click on the grid, you'll get an option to clear the bitmap. When you're done with a bitmap, close the dialog. The last input item is the "Luminance" spin button. This will set the luminance (intensity) for the LEDs. The default is usually sufficient. When you click "Send," the data will be sent to the device, and you'll be ready to disconnect the device and use it. 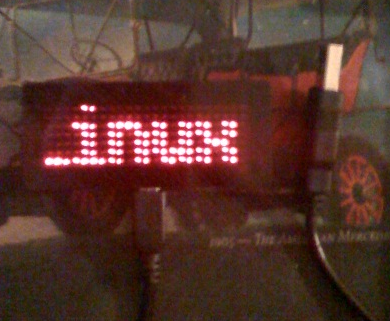 Update (1/10/11): Derek O. provided the following picture of the badge internals. It's apparently driven by a Holtek HT82K94E 8-bit MCU. Click on the image below for a full-size pic! Thanks, Derek! I had a look at the datasheet (linked above) for this particular MCU, and it would seem to take the USB clock and data lines directly to the chip, which would infer that the memory is on-chip. This raises the question of whether or not the commands sent to the device could be adapted to reprogram it. The instruction set is very straight-forward, although I didn't see any mention of what bits correspond to which instruction. However, the registers and instructions themselves are documented, so it gives some indication of what would be possible. Holtek has a Winblows-based IDE and emulator available for their microcontrollers, but I'm unaware of any option for Linux at present.